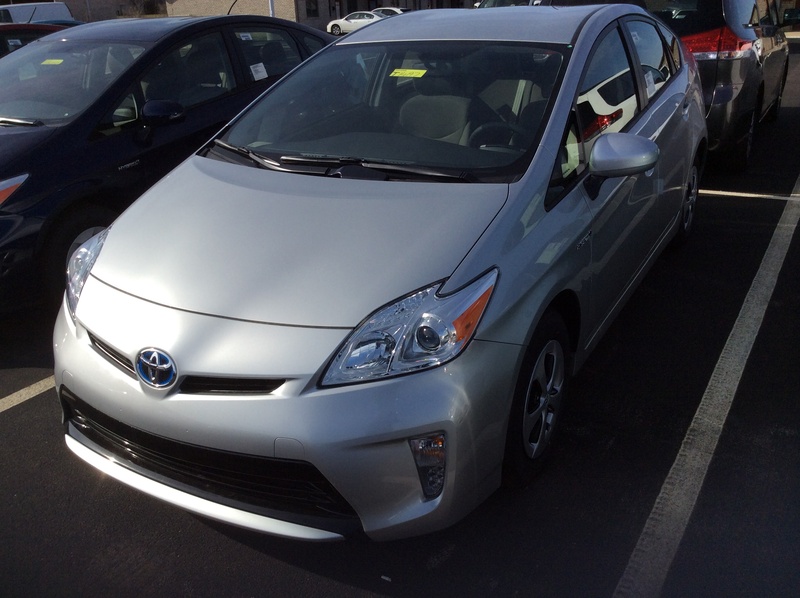 Prius versus Corolla – which car to purchase? An innovative math activity for middle or high school. Link to video with an overview of the activity. 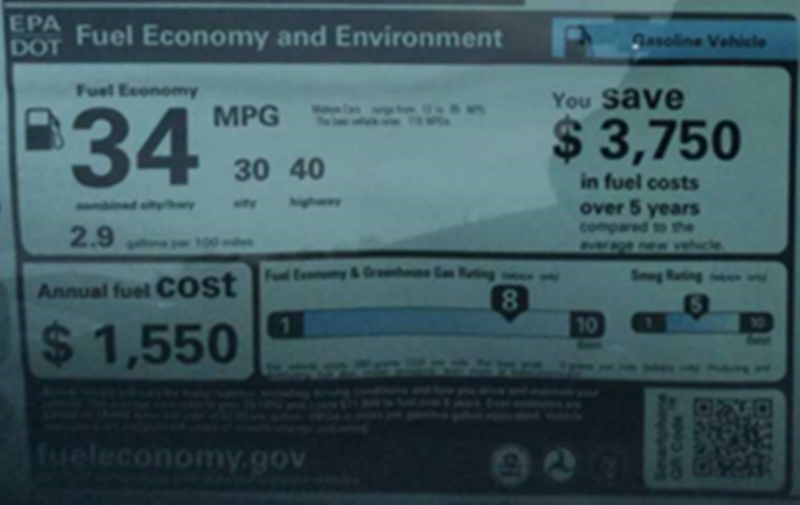 The Toyota Prius gets 48 mpg on the highway and 51 mpg in the city and has a sticker price of $25,235. 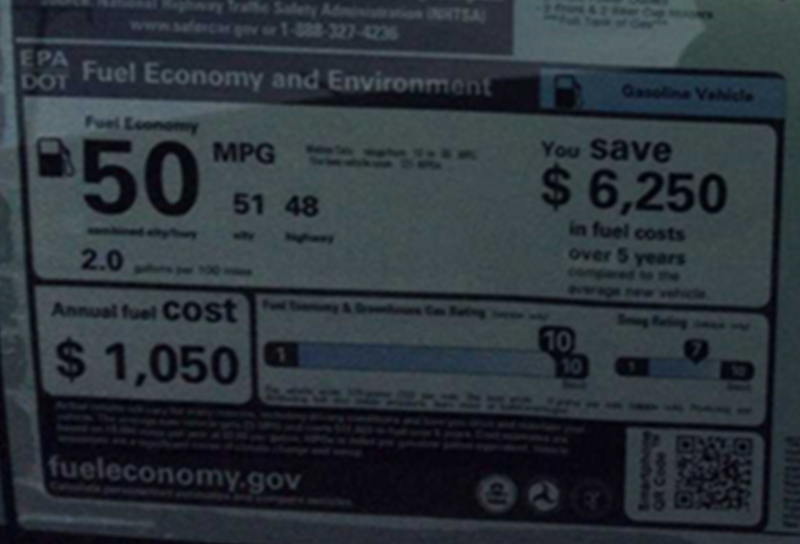 The Toyota Corolla gets 40 mpg on the highway and 30 mpg in the city and has a sticker price of $23,495. If we consider only the cost of the car and the cost of the fuel, which car will cost less? How was the ‘Annual Fuel Cost’ calculated? 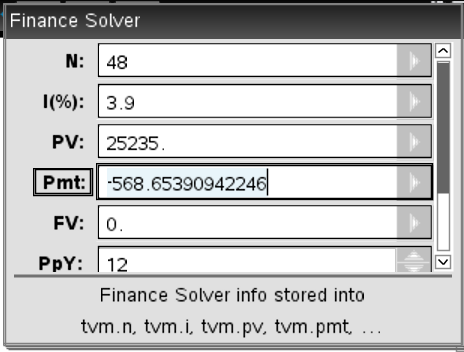 How was it calculated that you would save $6250 in fuel costs over 5 years? Why does the Prius get better gas mileage in the city than on the highway? 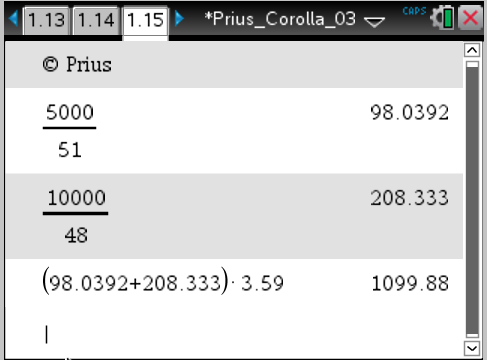 The Prius costs more, but uses less gas, so how long before it is cheaper to have a Prius? Have them discuss those questions in their groups and then discuss them as a whole class. The 4th question listed above, was the one that caused the most interest (and it was the one that I had hoped that they would generate). We made that the focus. I used Navigator to assess what each student was doing, to see which students were successful and which students needed assistance. Fortunately, most of the students were successful, and all of them were trying. STEP 2 a (optional): Create an amortization schedule for 2 or 3 months so that students can see first hand how interest is used. 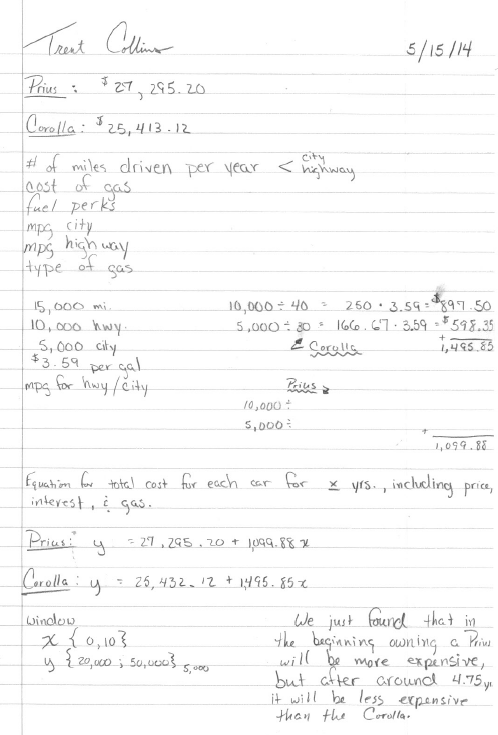 Then have the students create an amortization schedule using either a spreadsheet like Excel, or the spreadsheet app on TI-Nspire. This will allow the students to see how the first payments go more towards interest than the last payments do. And to see that the car loan is, in fact, paid off in 48 months. This also allows students to see the power of generalization and the power of spreadsheets. 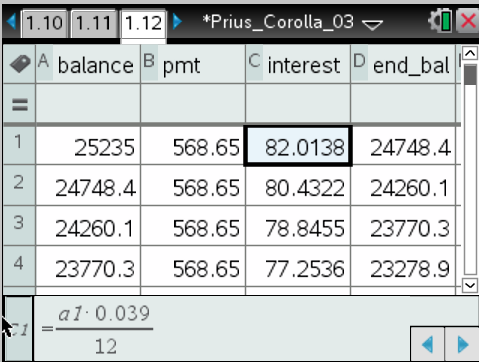 Notice the formulas for the calculation of interest on the left and the end_balance on the right. Step 3. 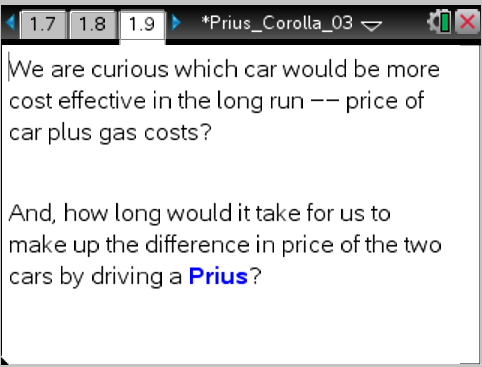 Questions to answer: How long do we need to keep the Prius before the total cost of the car plus the gas costs is cheaper for the Prius than for the Corolla? Where is the “break even” point? Instead of just giving the students the data that they need to know to answer these questions and solve the problem, I highly suggest that you have the students generate a list of questions that they need to know in order to solve the problem. Have them discuss in groups and then come together as a class and list them — good and not so good. 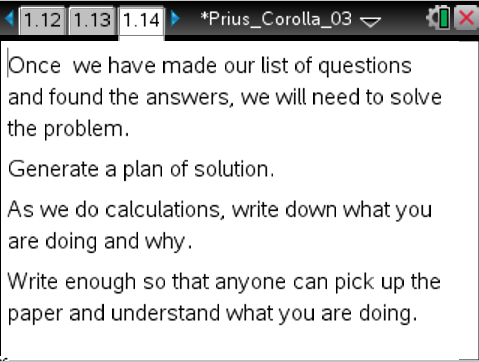 Then give them the answers to their questions and ask them to solve the problem. If there are too many questions, they should ignore that data and if they didn’t ask the right questions, they will get stuck and then ask. How many miles are driven per year? How many of those miles are highway? … city? What is the cost per gallon of gas that we should use? How often do we fill the tank? Step 4. Now how can we decide where the “break even” point will be? 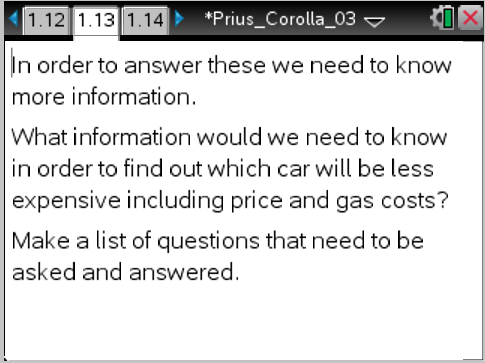 Allow students to discuss different ways to answer that question.Some possible ways to do this include i) guess ‘n check, ii) generate equations for each car that include the cost of the car and cost of gas per year and solve graphically, iii) use a spreadsheet. 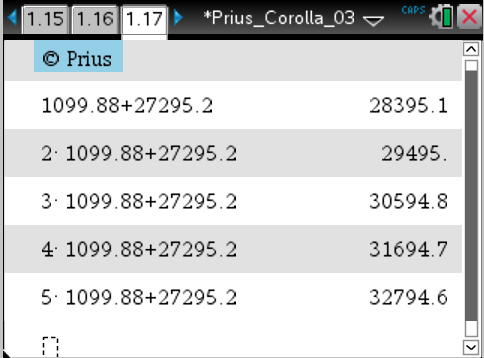 Notice that somewhere between the 4th and 5th years, the total cost for the Prius becomes less than that for the Corolla. By doing this guess ‘n check some students saw how we could generalize this. 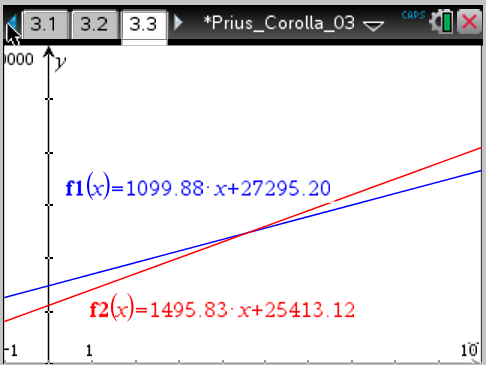 Let x represent the number of years, then the total cost, y, for each car could be described with an equation. A smooth transition to part ii. 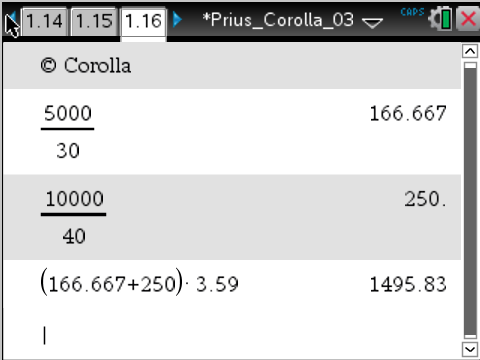 ii) The equation for the total cost for the Prius is y = 1099.88x + 27295.20. 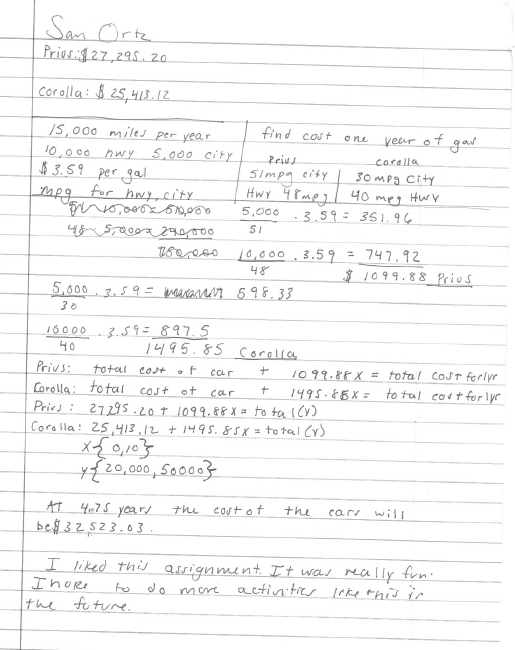 The equation for the total cost for the Corolla is y = 1496.83x + 25413.12. This is a great opportunity for discussing what the y-intercepts are for each equation and what it means in the problem situation. Another great opportunity is to discuss what the slope is for each equation and what it means in the problem situation. Emphasize that 1099.88 means dollars for gas per year. 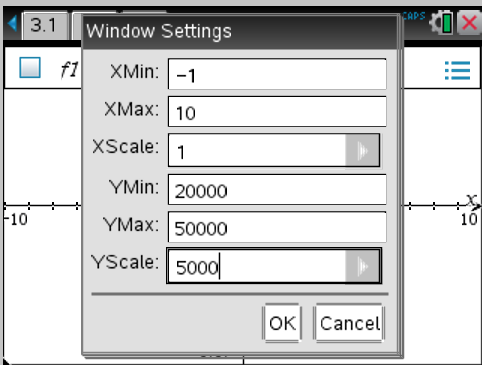 NOTE: Make sure the Graph Settings are set to Fix 2, otherwise the numbers will be in scientific notation. Now find the intersection point. But more importantly, make sure the students can explain what the numbers in the ordered pair mean in terms of the problem situation. 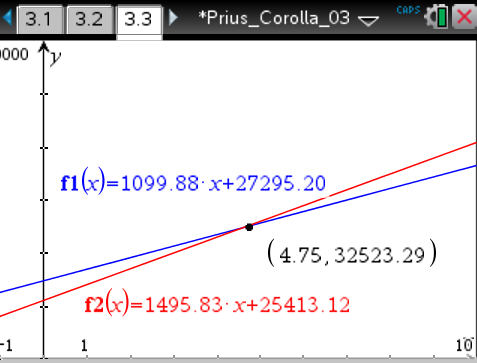 x = 4.75 means 4.75 years, that is, at 4 and 3/4 years, the cost of the car plus the gas costs will be the same, $32,523.29. Before that time, the Corolla is less expensive, and after that the Prius is less expensive. 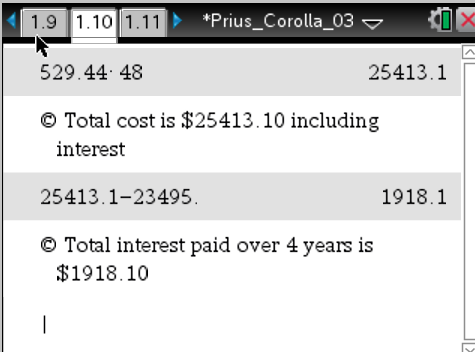 The longer we have the Prius after 4.75 years, the more money we save in gas costs. iii) Use a spreadsheet (optional). This is a good way to introduce the power of spreadsheets like Excel. (The TI-Nspire file will be included with all the materials.) A couple of screen shots are shown below with explanations of how they could be used. The top screen shot shows the data that is known. 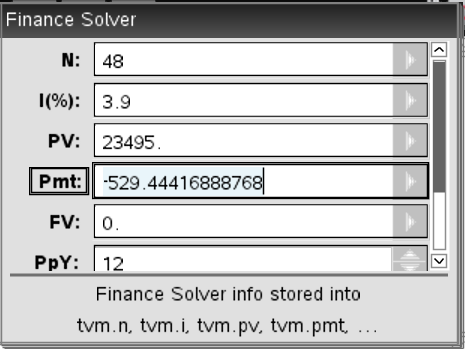 The bottom screen shot shows the calculations that were made. 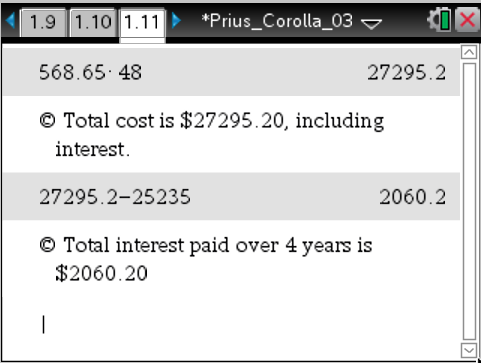 As you can see, the cost for the Prius is much more after one year. 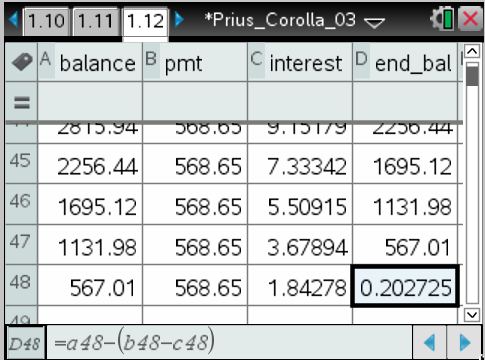 One of the powers of the spreadsheet is that it generalizes what we did so that if we wanted to compare other cars, we could easily do so. 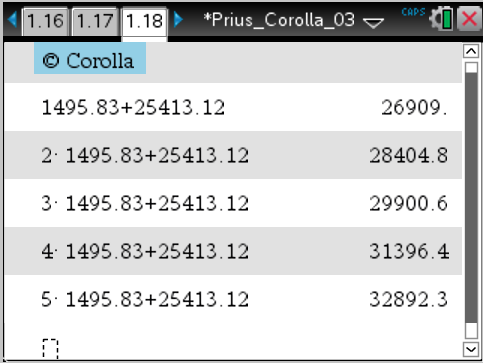 We can also quickly evaluate and compare each car at different numbers of years. See the screen shots for years 3, 4, and 5 below. Notice that the cost for each car is not exactly equal. We would need to discuss why, that is, that the point of intersection was not exactly at x = 4.75, but that x is rounded to the nearest hundredth, and that is why the costs are about a dollar off from being equal.